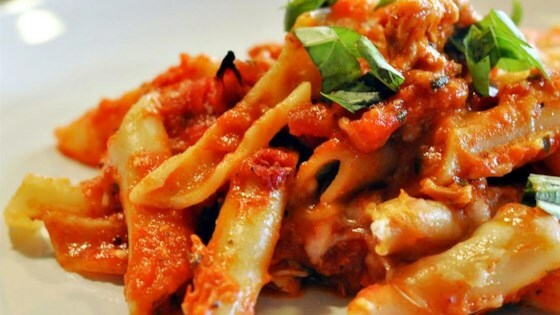 "I always use ziti to make this, it looks so elegant, but any macaroni will do. Serve with a Greek salad." Meanwhile, place sun-dried tomatoes, olives, parsley, olive oil, anchovy fillets, and garlic in a large serving bowl. Drain pasta. Transfer to serving bowl, and toss with the sauce. Serve. See how to make your own sun-dried tomatoes in the oven. Made this last nite, followed instuctions to the letter. No one in the house liked it.Was so dry, i even added pasta water to it to give it some moisture, but, it did'nt help. I liked this dish, but my husband doesn't really care for sun-dried tomatoes, so he asked me not to make it again.